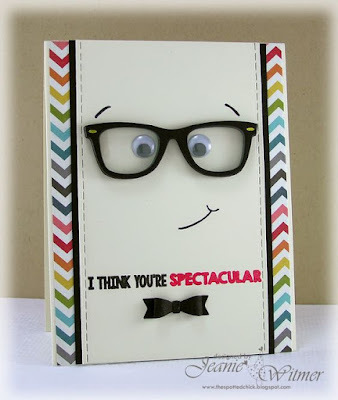 This is a really cute card for a guy - especially if he has glasses! This card has a really "cute" feel about it that celebrates wearing glasses. This card would be relatively easy to make yourself - plastic glasses such as these are readily available at discount stores (often in the toy/novelty section). Goggly eyes and bow are available at any craft/haberdashery store. You could print, write or stamp the text. Have some fun with the border on the card by using patterned paper, ribbons or even a strip of sequins. You could also experiment by using different coloured cards (instead of white). To create a female version of this card, simply add eye lashes and fuller, coloured lips and/or hair.